New York --- US President Barack Obama said today that the US was winning in Iraq and Syria. The Atlantic asked Obama if the US was losing the fight against ISIS, Obama said: “No, I don’t think we’re losing." City after city is falling. Yesterday it was Mosul. 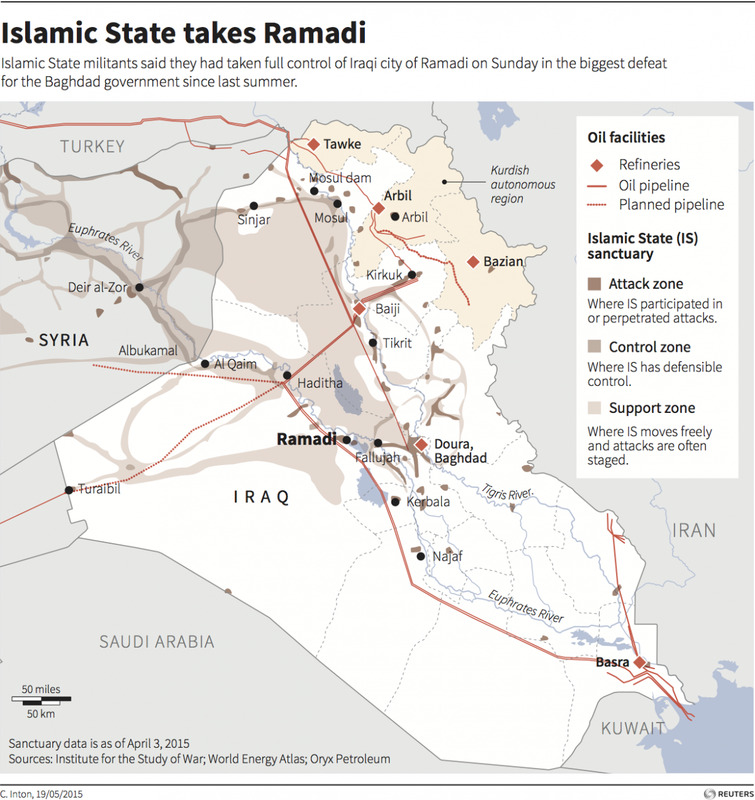 This week, it is the provincial capital of Ramadi in Iraq and the ancient Syrian city of Palmyra. 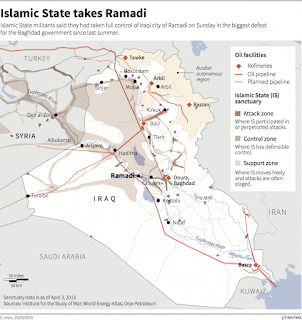 More than one third of Iraq is now controlled by ISIS with ISIS now less than 100 miles from Baghdad. News anchors from CNN to FOX News are asking: "if this is not losing, then what does losing look like?" The US has a President with no military experience. A man who is a dreamer. A dangerous dreamer who refuses to engage an enemy which beheads Christian children. Years ago, we had FDR who refused to take action. That invited Pearl Harbor. Today, we have already had our Pearl Harbor - it's called 9/11. But Obama still refuses to defend innocents overseas from an enemy which has called for the destruction of the United States. It's not an all or nothing proposition as Obama states. Again, his military ignorance screams out. We need boots on the ground but we do not need to be sucked into a long, drawn out war. We don't need to engage the enemy every hour of every day. The US military has rapid deployment forces, special forces which were just used for the first time under Obama in Iraq this past week. They go in, do their job and fly out. But Obama is reluctant to do even this. Obama is not a warrior. He is a lawyer. Perhaps he can sue ISIS and take them to the International Criminal Court. Bottom line - do something. Do not tell the US public that we are winning when hard fought successful battles under George W., US lives that were lost to stabilize Iraq, are now being lost. How can anyone ignore real and present danger? This made me think about how I became a Conservative. I was at IDF sniper target practice when suddenly I became very depressed. I stopped shooting. I was hitting bulls eyes shot after shot. I said to my commander: "I'm killing people. I'm hitting bulls eyes and killing people with each and every shot". He paused and motioned for me to walk over to him. "Leyden, it's either you or him. What do you want." These few words set all in perspective for years to come. It became quite clear that sometimes you just can't reach out and discuss things. There are times when negotiations do not work. And if you hesitate - you're dead. I was born a Democrat. Always wanting to understand and help the needy. I still help the needy but have learned that if someone is shooting at you or your family - shoot back. Obama never learned this. Nor will he. The Secret Service protects Obama. He need not worry for his family. My children who live under Iranian threat of nuclear weapons and of ISIS knocking at their small, Israeli borders are at risk. Jewish and Christian children who awake every day in the sleepy suburbs of the US are also at risk. When you have a President who lives in denial of ISIS taking over the Middle East - one has to start worrying about dirty bombs exploding in Chicago, Miami, Denver and LA. Allah Akbar has been heard in the US - from Boston and Texas to North Carolina and Denver. I pray that it does not take more Islamic terror attacks on our heartland for you to become a "Conservative". 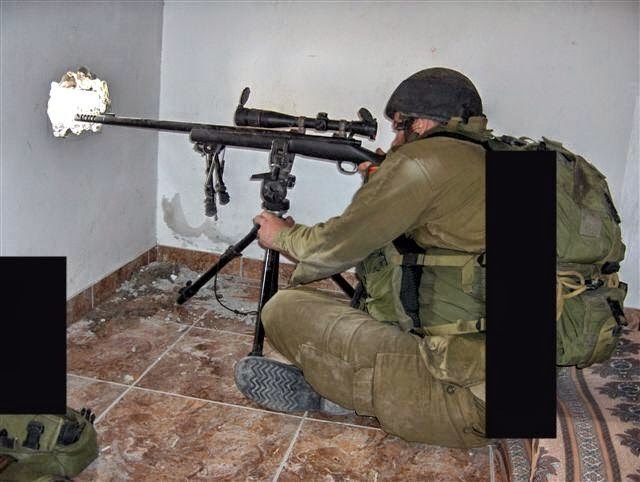 You need not go through IDF sniper training. IsraAID teams are still on the ground in Nepal working hard - helping communities restore their lives and prepare before the 3rd disaster hits Nepal (Monsoon season). Saving Lives, Providing Shelter is only part of IsraAid's humanitarian mission. Donating, sharing and encouraging family and friends to do so as well. Every dollar counts. Please put the following link on your Twitter, FB, and Instagram account. Click here and donate 10 dollars now! IsraAid joined the Israel Defense Forces, Magen David Adom and Chabad in providing emergency relief services in Nepal. Celebrate Israel Festival - Be There! 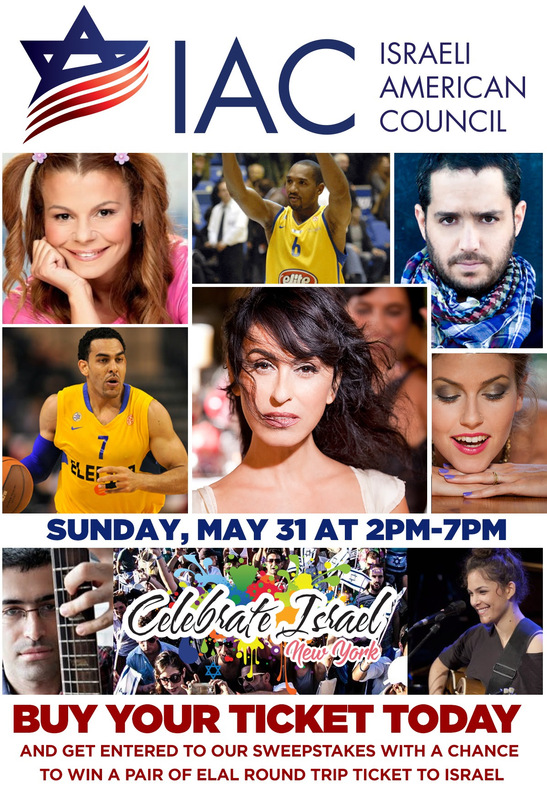 Celebrate Israel Festival, the largest celebration of Israeli culture in New York, will take place on Sunday May 31, 2015 from 2pm to 7pm at Pier 94 (located at 711 12th Ave, New York). Over 10,000 community members will celebrate the State of Israel with live entertainment, family activities, culture, food & art. Discount tickets sold online. Click HERE to buy tickets. Live Performances - Legendary Israeli pop singer Rita and children's star Rinat Gabay will be performing. Blue Note Presents: - Presenting some of the best Israeli jazz artists currently performing in NYC: Nadav Remez, Mika Hary, Yotam Silberstein and Dida Pelled. Jerusalem Western Wall - If you have not been to Israel, stop by the Kotel to put a note in the Wall. All notes will be sent to the real Kotel after the Festival. Technology Pavilion - Check out some of the latest Israeli technologies and innovations! Ted-style presentations will take place throughout the day. Visit our website for the full schedule. CAN WE SAY ISRAELI? Maccabi Tel-Aviv On The Basketball Court - Featuring two legendary former Maccabi Tel-Aviv players, Derrick Sharp and David Blu will shoot hoops, take photos with fans, and sign merchandise. Community Mural - We are excited to have Los Angeles based artist extraordinaire Tomer Perez back again. Stop by the large-scale community mural that Tomer will create, and grab a paintbrush to add your personal touch. We can't wait to see the finished masterpiece. Kosher Food - Enjoy traditional food and "street fare" that will inspire your next trip to Israel - 100% Kosher! "Israel 24/7" Instagram Photography Competition - Experience the everyday life of Israel from the people that live it! Now It's time to see the winners of the Instagram competition! CreateLAB - Design, build, create and be inspired at our famous CreateLab, open all day with multiple FREE art projects for the entire family. Express yourself and enjoy arts and crafts with our entire community. The Celebrate Israel Festival is a production of the Israeli American Council. BBC Is Amazed With IDF Humanitarian Field Hospital in Nepal! Jerusalem, Israel --- May 7, 2015 ... A BBC film crew was totally amazed how the Israel Defense Forces created a fully operating field hospital within 24 hours in the middle of a park in Nepal. The IDF humanitarian hospital offers free treatment and is located in Chhauni, near the Nepalese Military Hospital. The IDF field hospital receives both Nepalis and tourists 24 hours a day, every day. The 260-member IDF disaster team sent to Nepal in the wake of the earthquake there includes 40 medical personnel on a mission to save lives. One of their priorities was to set up a field hospital near Kathmandu. "The team brought the most recent technology possible," explains Lt. Col. Asi Hempel, a doctor in the IDF's Medical Corps. "The field hospital is equipped with everything: x-rays, operating rooms that will work 24/7, laboratories and more." The hospital has the ability to receive and provide care for around 200 patients a day. "Israel's top specialists for traumatic injuries are among the medical team in Nepal," says Lt. Col. Hempel. As of Thursday (May 7), the Israeli field hospital has treated over 1,000 patients. There have been 75 surgeries, and 8 babies have been delivered. The IDF Home Front Command is continuing in its efforts to assist Nepalese civilians, and organized an activity for children and teachers.